Since I started wearing shoes, back in the good old days, my parents had a very hard time finding shoes to fit me. At first my feet were just very narrow but as I grew older the feet began to grow longer. From the time I was 5 or 6 my feet grow with my age (Age 6, size 6; age 9, size 9; age 11 size 11 all in narrow) but thank goodness they stopped there. There was only one store in our town that sold size 11 AA with AAA heel but they were more for mature people and of course had to be order special. I know they were very expensive so I didn’t have the variety of shoes my girl friends had. I remember when I was in high school wearing brown and white oxfords to school and I had one pair of dress shoes for church and special occasions. We lived in an area where shoes were manufactured and my parents looked into having a last made for me, but each style of shoe would need its own last. I said no, as a teen I wanted as much of a variety of styles as possible. As I grew older more manufactures started making size 11 narrow shoes but they were still very expensive. My friends could buy several pairs for the price of one pair for me. Now size 11’s are very common but as in all things, as I approached retirement my feet have grown again. I now wear size 12 narrow or medium and there are very few available at any price and being retired doesn’t again I can’t afford high prices. Try to find a snow boot in size 12, HA! I blame my Father for these long narrow feet. When he past away at 75 he was wearing size 14 narrow. Thanks Dad! I wear an 11AAAA so I still have challenges to find shoes that fit my larger footprint. I, consequently, adore each pair of shoes that I have and never take them for granted. Each pair of shoes that I own has stories of things that happened when I wore that pair of shoes. I have found a few other women who have my size of shoe. Our bond is instant and strong, a thing that could never be shared by the 7 1/2 Mediums of the world. Looking for Size 10 Wide Fun, Affordable Shoes to Kick the Blahs! I live in East TN. U.S.A. I have such a hard time finding size 10 D shoes that have style!!! I would love to dress up sometimes, to kick the just turned 50 blahs…. but since I have no shoes, its pointless to bother…jeans are nice but these days I want to look a bit nicer for a dinner date….are there ANY stores that carry affordable shoes in my size…or do I have to live in flip flops and rain boots forever? HELP!!! There’s nothing like a new pair of shoes to kick the blahs…. at any age! I want to respond to two parts of your question before going deep into answers. First, what makes you think you are a 10D? This is also a 10W, a wide but not too wide size 10. It is a shame (shame on the shoe industry!) that you have a hard time finding this size. But since you do, and presumably haven’t seen many, I’m wondering why you think it is the right size? You could be a 9 or even an 8 Extra Wide. You could be a 10.5M. Or you could just have a thicker foot or wider forefoot and so need to select shoe styles of a certain shape. Please do read http://www.designershoes.com/about-size/width and http://www.designershoes.com/about-size/measure-feet and then use your knowledge to pick the correct size from this size chart http://www.designershoes.com/size-chart. One of the saddest parts of my job is discovering how few women really know what size (or sizes!) shoes they should wear. But for the purposes of answering your question, I will assume you are a 10 Wide. Second, what is your definition of “affordable shoes”? The Shoe Lady loves to holiday in the Bergdorf Goodman women’s shoe department. It is free to go there and it is such a huge treat to see all those beautiful shoes. But The Shoe Lady knows that “affordable shoes” at Bergdorf’s are around $500. She assumes (again!) that this is probably not the price you had in mind? Materials are a big component of shoe cost. Leather vs. faux leather. Another big component of cost is the size of the manufacturing run. If the brand made 10,000 pair of that style, it will be a lot cheaper per pair than if the brand made 100 pair. Location is also a factor for two reasons. First, if they were manufactured in a country with low labor rates, they will be cheaper. Second if they were manufactured in a country that keeps their dollar to local currency exchange rate artificially low, allowing the dollar to buy more, they will also be cheaper. (China? Could we be talking about you?) So if you want to buy all leather shoes made in Italy where the cost of labor is based on a living wage and the Euro is strong, then you will pay more, no matter how big the manufacturing run for that style. But you are looking for fun, fashionable shoes to kick those blahs! They don’t have to be leather. And China, in the last decade, has learned how to make excellent shoes. So there are options. Now let’s find a price range that is affordable. The Shoe Lady thought she’d do an online search to confirm her idea of the average price of women’s shoes. One source says $85. One source says $49. The Shoe Lady was prepared to guess $65. And, as math would have it, the average between these two sources is $67. Let’s go with $65. This includes the occasional pair of leather boots, the fabric sneakers you found on sale, etc. Now let’s make that average more affordable by knocking it down by 25% to $50. I will assume (again!) that this is ok with you? Let’s go shopping for size 10 wides and see what we can find that would kick those blahs for $50 or less? The only exception, not on that page, is the Fit in Clouds style ($22) fits size 10W , each size covers half sizes and widths but you should order the size 11M because the 10W isn’t listed. The prices range from $22 to $49.99. But wait! There’s more! 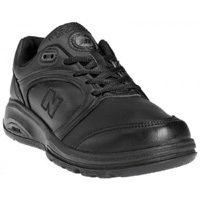 If you sign up for the ShoeNews email from DesignerShoes.com, you will get a new discount coupon about once a week. Those coupons help make shoes more affordable too. Please do write and let me know if my assumptions about your shoe size and “affordable shoes” are correct? Bella Vita Deidre Black Patent platform sandal. $46.54. Dyeables Grandeur in Merlot, strappy dress sandal, $27.97. Dyeables Elegance White slingback sandal, $13.97. Have it dyed or color it yourself! Bellini brand Dubai in Orange (also available in lime green). $49. 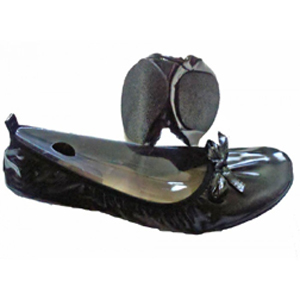 Fit In Cloud Black Patent flexi-fit ballet flat. $22. Touch Ups brand Abby dressy d’Orsay style pump in Silver. $47. 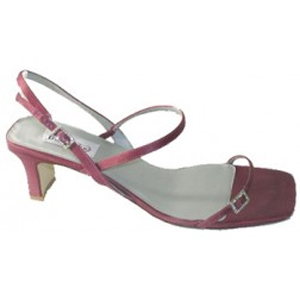 Aerosoles brand Raspberry in Purple Combo. $49.99. Touch Ups brand Gemini dressy pump in Black. $49.99. Hiya, I was so surprised to find a response to my comment from you! Thank you! I have measured my feet and they are 4 1/8th W x 10 1/8th L with what looks to be closer to the A shape than B…wet footprint…thanks to dogs water…lol (yes, I gave them fresh cleaned bowl) shows a very slight side mark between heel and ball of my foot…high arches! Ugh! I live on my SSDI of 754.00 a month and yes, it is very hard to find shoes!! I plan to look at the shoes you suggested now but I wante to remember to thank you first!! Peace & thanks again from… hopefully, barefoot & flip flops no more!!! Please ASAP your response as the few pairs of shoes I have left are wearing out and I don’t know if or when I will be able to replace them. I have a dear friend who is a huge fan shoes from the early years of Easy Spirit (remember the ladies playing basketball in their heels?). She has been asking me for 15 years, ever since I became the Shoe Lady, where she can get shoes like those original laceup styles she loved. I will tell you what I tell her whenever she asks. The shoes do not exist any longer. Easy Spirit exists in a market economy. They developed a great brand reputation and they took the brand name, sold the name and stopped the manufacturing. I’m not sure how many times the Easy Spirit brand name has been sold since you first bought your Easy Spirit’s 20 years ago. But I assure you, each new owner has brought their own sense of what manufacturing standards should be in order to sustain their market. These decisions, unfortunately, have excluded many of the features that you liked so much in the original shoes. Next up: what ever happened to combination lasts? America is a wonderful place. Up through the mid 1960’s we owned shoe manufacturing for the world and did an excellent job making shoes not only in different sizes and half sizes, not only in 6-7 different widths per size but also in different widths for the front and the back of each shoe! What a country! Think about it. A woman wanting a size 7 could get that shoe in about 40 different combinations of widths! Alas, as the shoe industry discovered, such attention to customer needs could not be sustained once tariffs dropped and foreign competition came into the shoe industry. About 15 years ago there were one or two brands that still offered combination lasts but those have closed. That’s the bad news. The good news is that many brands that care about comfort (and there are many) took a lesson from the days of combination lasts and realized that traditional lasting had not taken into consideration that women’s feet do tend to be disproportionately narrower at the heel than those old lasts had assumed. So these comfort brands developed lasts that kept the width measurements across the ball of the foot but were narrower in the heel. Euro sizing also assumes a narrower heel. 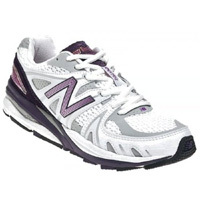 But they have one basic width for the forefoot which would be too wide for your slim feet. I suggest you give up on the quest for a combination last but focus instead on brands that offer you a laceup style in a size 7S (AAA, Slim). Even this will be a challenge as many of the comfort brands are focusing more on wider feet than on narrower feet as the wider footed population (you’ll excuse me here!) grows. There are fewer styles offered in the slim (AAA) widths. There are a few brands I can suggest to you that should offer the quality you want and accommodate your orthotics. But each has some limitations. 1. 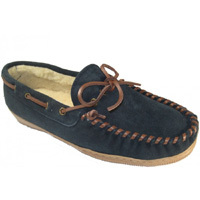 Propet: They have some laceup styles but they only make widths to size 7 narrow. Every shoe is built with removable orthotics. 2. Ros Hommerson: They have been off the market for about a year but are back this fall and there is a style, the Nancy, that should work well for you. In order to accommodate the market and financing of their lasts, they have skipped over the “slim” width and offer their laceups in narrow and “extra slim”. 3. Softwalk: They do make 7 slim but I don’t see any laceups yet this Fall. 4. Trotters: Several nice flats but no laceups yet. For saving money on shoes, I definitely recommend that you sign up here: http://www.admail.net/form/2696/28/ to receive the weekly SHOENEWS email which regularly includes discount coupon codes for shoes at DesignerShoes.com. For shoe repair, if you can find a good shoe repair place, go back regularly and have them maintain your shoes. The shoe repair shops are a dying breed and we will miss them when they are gone, especially those of us with hard to fit feet who have limited choices and need to make our shoes last a long time because, as you have discovered, who knows when we will find shoes that fit us again!